FRANKFURT -- Carlos Ghosn and Dieter Zetsche's annual press conference, known on the auto show circuit as "The Carlos and Dieter Show," would be easy to dismiss as mere self-congratulation. At the auto show here, the two CEOs once again spent an amiable hour recounting their companies' joint projects. But in this year of feverish merger talk, it took on broader implications. 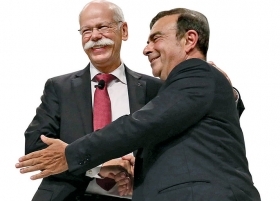 The cooperation between Ghosn's Renault-Nissan Alliance and Zetsche's Daimler produces impressive results and seemingly very little backbiting or culture clash. 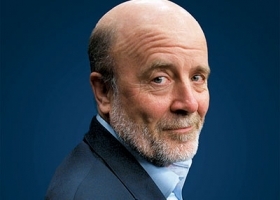 The secret seems to be in the two CEOs' preference for the pragmatic over the grandiose. The two automotive giants' hookup is essentially a series of one-offs. The companies have taken small equity stakes in each other but profess no interest in merging. Instead, they work up business cases and do the projects that seem most promising. Dieter Zetsche, left, of Daimler AG and Carlos Ghosn of Renault-Nissan: The secret to their companies' successful cooperation seems to be in the CEOs' preference for the pragmatic over the grandiose. The two companies are building a $1 billion plant in Aguascalientes, Mexico, to assemble luxury compacts for Mercedes-Benz and Infiniti. The Infiniti Q30 compact shown in Frankfurt was developed on a Mercedes architecture. Infiniti will get a Daimler-designed four-cylinder engine built at an Infiniti engine plant in Decherd, Tenn.
Mercedes is developing a one-ton pickup on the bones of the Nissan Frontier. The key, executives say, is that they do only win-wins. They don't do a project that favors one side, hoping to rebalance things next time. Both automakers have unsuccessful mergers in their past -- Renault's aborted attempt to merge with Volvo in 1992-93, and, of course, DaimlerChrysler. Perhaps that's why Zetsche and Ghosn show no interest in a full-fledged merger. Throughout, the companies' cooperation follows a careful etiquette, down to the details of the press conferences. Those rotate between the alternating European fall auto shows in Frankfurt -- Zetsche's turf -- and Paris -- Ghosn's turf. At them, the public relations persons for the two companies take turns recognizing speakers. At Frankfurt, without ever mentioning the name "Sergio Marchionne," the two CEOs managed to pooh-pooh the Fiat Chrysler Automobiles CEO's position that industry mergers are critical for survival. Noting "all the current talk of consolidation in the industry," Ghosn said the Renault-Nissan-Daimler arrangement "points to a smarter way to increase value for our companies and our shareholders." Zetsche was succinct: "Everyone knows you don't change a winning team."